What Is BIGFOOT??? Do they REALLY exist??? This photo is one of 14 photos supposedly taken by a forest game officer in July 1995. The officer was following up on a lead about some bear poachers in the Wild Creek area near Mt. Rainier, Washington, according to Cliff Crook. Crook says he purchased 7 of the best photos. This is the only photo that he released to the public. Crook claims that you can see the other 6 photos in person by appointment only. This second photo has just recently surfaced. Most of the people involved with bigfoot research agree that this photo confirms that the Wild Creek photographs are a hoax. Meeting for Bigfoot Interview, recorded and received July 15, 1995, 1:PM - Bigfoot Central. Elevation: 2,500' Weather: 75* Cloudy/Sunshine. Nature of Business on Encounter: Off trail trek. Report Claim Incident: Heard loud splashing noises to far left while hiking off trail in Snoqualamie National Forest near Wild Creek - upon investigating sounds, looked down, saw, and photographed, a Sasquatch. Number of photos taken: (14) (6) in focus (8) shaded. Camera: 35 MM Minolta (50mm lens) no sun reflector. Distance: 25 - 30 yards. (estimated) from high bank above lagoon/sasquatch. Photo News Released: October 1995 Studio Interview-Frank Kracher w/Cliff Crook (KIRO) TV "7 Live" Seattle, Wa. (Also:) "Bigfoot Trails" Newsletter Summer issues 1995. Photo Release Date: November 5, 1995 - Journal American Breaks Story W/A Photo. Bigfoot Central Sasquatch Report File Letter to: Investigators/Colleagues From: Cliff Crook 1/22/96 Bothell, Wa. 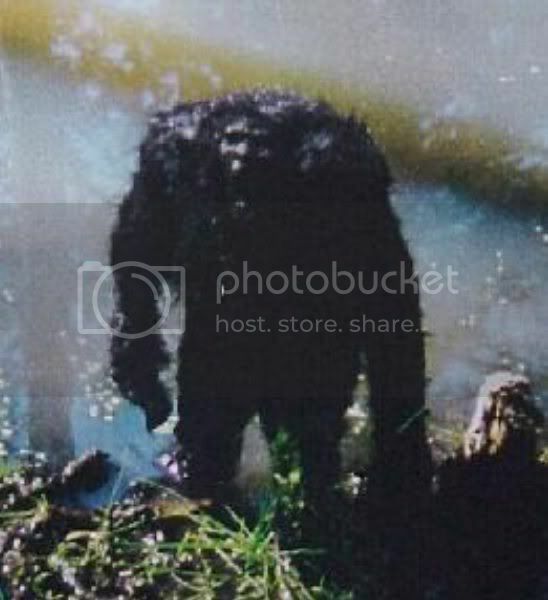 CREATURE APPEARANCE: Very important to note that the "Sasquatch" was reported photographed from a steep bank, high over the lagoon, giving the creature a very hulking, bulky image, exaggerated shoulder mass, absence of neck, and an extra low appearance of head position. The creature's hair covering was said "matted and wet". The encounter witness also estimates the distance that he stood above the Sasquatch was at around (20 to 30 yards). After considering the angle/position and distance from the eye of the camera, it may clear up some confusion about the anatomy we would expect from a Sasquatch photo that was taken from a much lower plain, or from a level surface. Now we can avoid any snap decisions RE: first impressions or, realize any seemed deformations that may have been noted as unusual in our early observations of the creature's appearances. PHOTO EXAMINATIONS: On December 9th, 1995 during Panel: Bigfoot Meeting held in Bothell, a photo lab proprietor who represented himeslef to the (50) Panel: Bigfoot guests, panelists, and media as a "photo expert" claimed to have found tiny diamond shapes or, sign of electronic imaging inside the (electronically imaged lazer print photo copies). NOT the actual photographs. In my estimation, this should instantly disqualify the gentleman as a genuine photo expert. The OTHER "photo experts" (all), have detected no seams, sign(s), of photo imaging, clues of altering, or any; merest trace of photo fakery inside the photographs (or) negatives. To date (12) "photo experts" have carefully examined the photographs (to my knowledge). PHOTO SURROUNDINGS: The witness reports the time of his encounter incident to have occurred at around (2:PM). A mirrored reflection of the sun inside the swamp (lagoon) was captured inside on of the photos and is clearly visible, lending ample support to his time frame estimate. His 35mm camera with 50mm lens had no sun reflector. He stated that the clouds were moving across the face of the sun and that during some moments of his photo taking, the area turned from bright to dark. Most simple mathamatics would suggest taking sunlight reflecting through trees - add clouds moving across face of sun, add water reflections to tree reflections and, the equation may be: "unusual appearing surroundings" inside photographs. FLORA PICTURED: Just behind the creature's left side appears to be a stump (possibly a beaver cut tree trunk). There are swamp grasses and reeds which appear native to Cascade Backwater ponds/swamps. Birch or Aspen trees can be seen reflecting inside the lagoon in some of the photos. In essence, nothing appearing unusual in and around the swamp area with exception of the Sasquatch. WITNESS: Chooses Mr. X identity. Occupation: Forest Patrol - Snoqualamie National Forest. Extra Notes: Each of you are on invitation list to join May 5th Panel: Bigfoot Programe, Harrison B.C. Canada during "Sasquatch Daze" event as panelist. Although the photos appear genuine, this is a case of many more worthwhile questions and much more extensive information is available to evaluate. If there has been a loose thread to unravel, it has remained well concealed at this point. Over a dozen photo specialists from Seattle to Spokane participated in this second gathering of experts to examine the Wild Creek Bigfoot Photos. It was unanimously determined by the confluence of all photo experts attending, that the photographs and negatives were free from any sign of super-imposement, altering, or photo fakery. Several of the photo examiners had previously submitted written questions to the forester who shot the photos on July 11, 1995. PANEL NOTES: Panelists added that the proprietor of the local area photo lab who attended Panel: Bigfoot I Conference on 12/9/95, substantially disqualified himself as a bonified photo inspector after confusing lazer print copies made from the photos with the actual photographs. When confronted by a local newspaper reporter about the nulification of his findings, the Eastside photo shop proprietor refused comment. BIGFOOT PHOTO SITE: Periodic investigations at the Wild Creek photo site have continued to support the veracity of the forester's report and, no clues to dispel the validity of the forester's account have been detected. BIGFOOT PHOTO #3 Several less circulated Bigfoot photos from the Wild Creek area are now available for Researcher's files and widespread viewing. Photo#3, which is of fine clarity, is also available for wider circulation. BIGFOOT CENTRAL extends thanks to the panel members and guests who attended PANEL: BIGFOOT II on August 27th. Progressive findings at the photo site have continued to stringly support the veracity of the forester's account. A distinct tree appearing in one of the photographs was identified at the report scene and became the marker post used to accurately find both the furthest guestimated distance given between the forester and the Sasquatch, as well as to determine the height and size of the "Sasquatch" as captured on camera. The distance from the forester and the Sasquatch at the furthest point was (67) yards. His estimate was 50 to 60 yards. The distance from the nearest point )camera to Sasquatch) was accurately measured at (39) yards. His reported estimate was (25-30 yds. above the Sasquatch/swamp). His estimated height of the Sasquatch was ("around 8'.") The measurement was taken from the swamp floor to a mark point of the tree where the Sasquatch stood. The height measurement was revealed at 7' - 10'. Further information is being gathered and compiled at this time and due to on site investigation ti progress, the release of new and additional findings from the report scene will be released in upcoming issues of the newzine. Findings: (Direct quote): The question is, are the photos real. I did not find any kind of tampering or doctoring of the photos." Translator: Josiah Wallace (Seattle Pacific University) 4/28/97 (Arrangements for photo analysis and findings release) Cr: John Ellis - Josiah Wallace - KEI) Tokyo, Japan - Seattle Pacific University - Mr. Noriyuki Kurokawa - Epson Square Laboratories, Tokyo, Japan - Cliff Crook, Bothell, Washington, USA. Video taped from Epson Square - Tokyo, Japan 2/97 - Bigfoot Central File Tape #(WC7BC-C). NOTE: WILD CREEK BIGFOOT PHOTO FINDINGS: All sopisticated photography tests have shown that no tampering, altering, or signs of fabrication are present in the photographs. The above information was retrieved from squatchopedia.com. 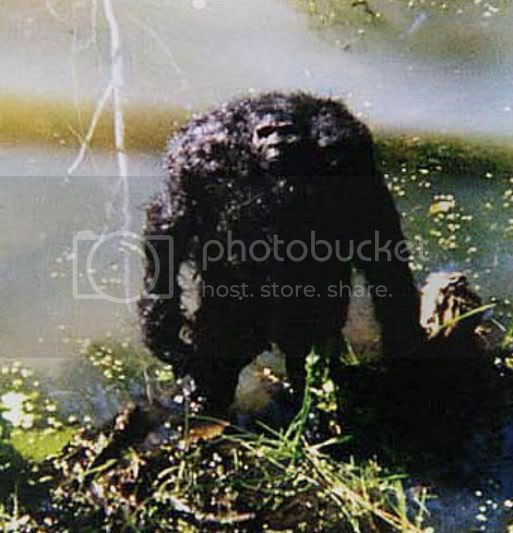 Click here to read a discussion regarding the Wild Creek Bigfoot Photos at Bigfoot Forums.